At Choice One Dental Care of Cartersville, we provide patient centered care in a family-friendly environment. Your child’s comfort is our highest priority. Our experienced kids dentist, Dr. Richard Kim, enjoys caring for children and teens of all ages, including babies as young as one year old. Our caring team loves children and are specially trained to put them at ease. We’ll teach your children the proper way to take care of their teeth so they can learn that going to the dentist can be fun! Call (770) 387-4533 now to book your child’s first appointment! We are in network with many insurance companies, including Ameritas, Aetna, BCBS of GA, Cigna, Humana, Metlife, Delta Detal, Guardian, Dentamax, United Concordia, United Health & Princial. Don’t let lack of dental insurance coverage or costs get in the way of your child’s oral heath. With options for every budget, we’ll help you access the dental care your children need. Have you ever gone to a dentist office where you were told that you needed treatment, but didn’t understand exactly why? 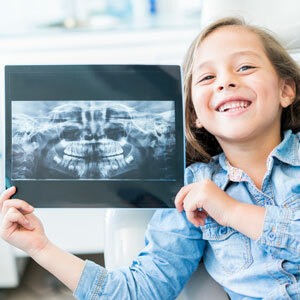 Our dental team uses digital X-rays and imaging to show you exactly what we see during your exam, so that you completely understand any treatment recommended for your little ones. It’s just one of the ways we ensure that our techniques are oriented to the unique needs of each individual patient. Enjoy a pain free, no-stress dental experience that will keep your child comfortable and relaxed. Call (770) 387-4533 today!